The impending closure of Louth's ambulance station was up for discussion as Jackie Featherstone gave the town council an update on the current situation at their meeting on Tuesday night. Jackie is a concerned citizen, not an NHS employee. I don't know how much we should read into the fact that to date no local paramedics have felt able to address the council about this. So far Jackie has gathered 1457 signatures from people protesting the plans, plus another 108 in an online petition. "When they plan to move the ambulance station to Skegness we will not be getting cover and this worries me quite a lot," she said. Jackie's assessment of the future of the station was downbeat. Councillor Margaret Ottaway referred to the EMAS consultation document entitled Have Your Say on Your Ambulance Service: Being the Best. "I think the key is that we all fill in that simple questionnaire at the back of the book," she said. That would be all very well if everyone had a copy of the booklet, but I don't believe it has been distributed to every household in the area, so there may be some people who still don't know this is going on. "There are going to be serious repercussions," Jackie Featherstone warned. "This scheme has not been thought through." This is all pretty grim, but talk then turned to more cheerful matters. Trevor Fairburn Butchers of Mercer Row is once again Lincolnshire Butcher of the Year. 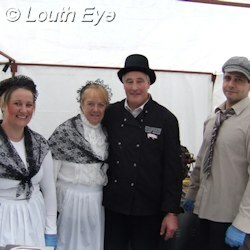 The Victorian Family Fayre was also singled out for praise, as was "Georgina Horton". There were more people than ever, and more people in costume," said the Mayor, Jill Makinson-Sanders. The only problem with this event was the parking arrangements, mentioned by both Councillor Councillor Sue Locking and Councillor Ottaway. "The problem was they just put 'Diversion' on the signs and not 'Diversion and Parking'" Councillor Ottaway noted. Councillor Craig Leyland, the ELDC portfolio holder for economic regeneration, which includes a remit for market towns and markets, was due to address the town council, but he cancelled. This is the third meeting with Louth's town councillors that he has failed to attend, according to the Mayor. "I'm quite surprised Councillor Leyland doesn't appreciate how passionate Louth people are about the markets," she remarked. Councillor David Wing was far more blunt. "I know exactly why he hasn't come. I think he's yellow." Councillor Leyland and ELDC came under fire for failing to make improvements to the market, in spite of plans to do something about it months ago. Councillor Horton spoke out about the delays: "It's getting very, very frustrating. This has gone on far too long, it's 2012 and still nothing has been done. 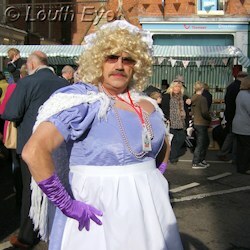 The market stallholders won't stand any more." It's a pleasant change for an LTC planning meeting not to involve major plans to re-map the town's urban landscape. This week there were a few people wanting to change windows and shop signs in minor ways, and someone else wanting to put in some ponds and a model railway at a property on Keddington. The Halifax in the Cornmarket was refused permission to put up internally illuminated signs because the materials were thought to be wrong and out of keeping with the area, but the council approved everything else. There are a couple of new streets that need names near Riverhead, and the developers Persimmon have proposed Waterside Court and Riverside Court. This is similar to Waterside Mews and Riverside Rise nearby, so the Mayor came up with the suggestion of naming these streets after ducks. We're talking mallard or teal, not Daffy or Donald. Although given the location, Councillor Locking's suggestion of "Floodgate" seems apt. Discussion returned to the hot topic of ambulances, and in particular the public meeting at the Meridian Leisure Centre which was attended by about 30 people. "It was at the wrong time of day and badly advertised," Councillor Trevor Marris said. Councillor Laura Stephenson also mentioned that it clashed with a district council meeting. The consensus was that it was really badly attended considering the strength of feeling in the town against the closures. I wasn't able to attend because of the 2pm-4pm timing, and it angers me. We're facing a grim meathook future of no station for 26 miles because we live in the wrong place. When I was in Brighton recently I had to call an ambulance for a man who had a seizure in the street, and in spite of the operator misunderstanding me it was on the scene within four minutes. In Louth we're geographically challenged because people are more spread out, so that kind of response time is already unlikely here. Councillor Brian Burnett had a good point to make about the environmental impact. "Professional people will be spending an hour a day travelling to Skegness. How can they reduce their carbon footprint with all these cars going all over the place?" Several council members also criticised the costing of this scheme. In order to replace the stations with community ambulance posts, these posts will have to be built, but members expressed doubts about whether the sums had been thought through. Before the council meeting started there was news that a lorry had shed its load on the bypass, and emergency vehicles were out in force, as if to emphasise how important this service is to our community. There will be people out around town asking the public to sign a petition for the Keep Calm and Save Louth Ambulance Station campaign. In the fight to retain our service, it's now or never.